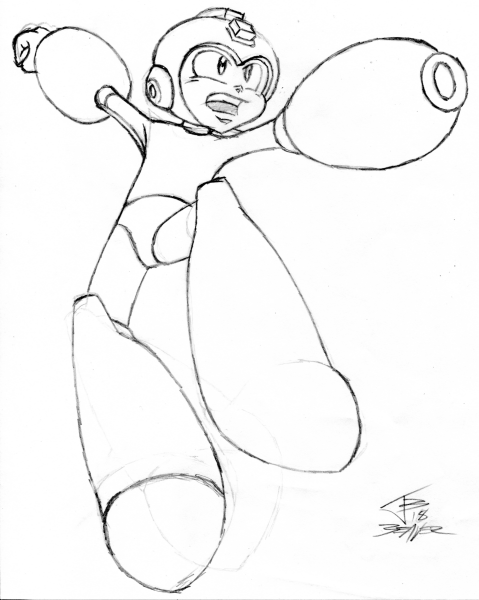 Trying to get that classic Mega Man official art look. 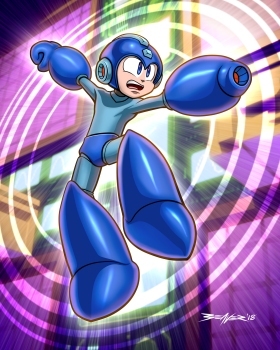 The background is based on Mega Man 2's Wily Castle teleporter stage where you jump into chambers to fight the robot masters again, but I changed the colors (which were mostly blue) so Mega Man wouldn't blend into them so much. The background model textures were done as pixel art, so don't be surprised if you see a remake of that Wily background on ScrollBoss at some point. Inked in Clip Studio Pro (over a sketch), coloring in PaintShop Pro X5, 3-D background work made in Blender.